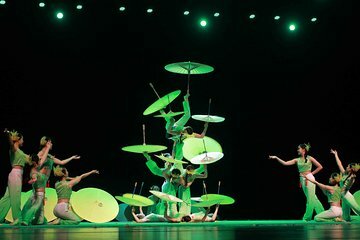 Go on a night out on the town with this 4-hour acrobat show and dim sum dinner experience in Shanghai, including round-trip transport. Head to the Shanghai Acrobatic Theater, and watch from your seating as amazing acrobats perform tricks to upbeat music. Afterward, pop into a local restaurant in the city’s French Concession area, and enjoy an array of delicious dim sum dishes. I want let all you know how much our group liked and appreciated Wilson as a tour guide. He was so pleasant, professional and accommodating. Our driver was excellent as well. We would recommend this company's services to everyone. This was increasable show - such talented people - REALLY IMPRESSIVE!!! I bought tickets for this show as my husband wanted to go and see it, however I thought that I would be bored - NOT!!! I was at the end of my seat every minute of the show. Our guide was young lady who was very eager to please and was doing everything in her power to make us happy. We didn't go and eat dinner as we have already eaten earlier guided by the same young lade - Snow. This experience was well thought about. The local agency that Snow works for was very responsive and even returned us money for dinner that we didn't eat.